Orchid is a free Windows 8 Amazon Price Tracker. It will allow you to track for price drop for any particular product. This app also allow you to watch price history to see how price has changed for a duration you select. In addition to that you can search through the products that are available through Amazon.com. You can search for products using keywords and product names using the built-in search feature. 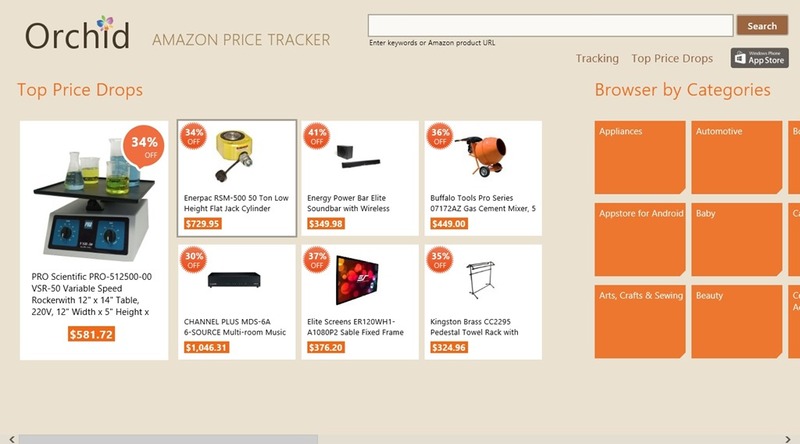 This Amazon price Tracker is freely available in the Shopping category of the Windows Store. As you land into Orchid, some Top shopping deals will be available on the screen itself. In addition to that, you can also browse through the products categorized according to their use. From the available categories are some like Automotive, Appliances, Beauty, clothing, and many others like that. As you start looking through the products from the app, recently viewed products will start adding in the Viewed Products category that is available on the main landing page of the app. From there you can get to those products quickly. 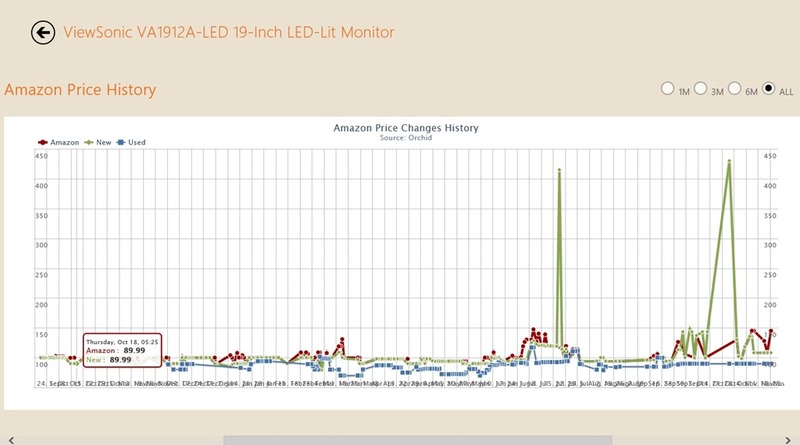 In the overview of the product, you would be able to see its price on Amazon.com, its price in market, and its price in the market in the past. Along with that, you also get the option to buy the product directly from Amazon. When you use the Buy option, the app will use the Windows 8 IE app to get you to the payment page. In this option available, you would be able to view how the price of the product has changed in the past. The index will reflect the New Market place price, the old marketplace price, and its price on Amazon. Go on any of the point that is available here, and you would be shown all the three prices for that date. The index that will be available here can be customized according to the duration for which you want to see the price variation. For that, you can use the option for it available on the top of the index. In this option, you can set a price for any particular product. When the price of the product will reach that mentioned price, the app shall notify you about it, using your email id, or your Twitter Handle. A price choosing bar is available there. 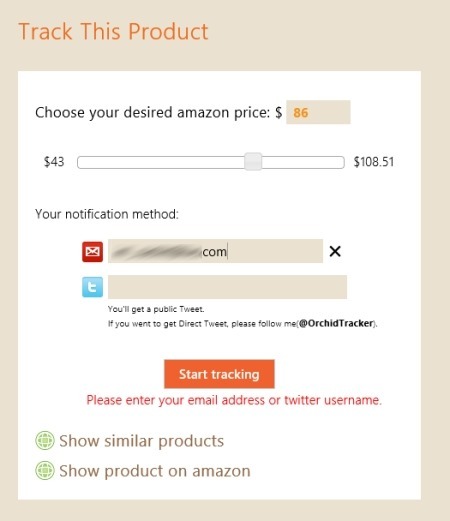 You can choose your price by sliding it to the right or left and as you mention your email id, or Twitter Handle, and click on the Start Tracking option, and the app will be set to notify you. This Windows 8 Amazon Price Tracker is freely available. Its Interface is nice and working is quite smooth. You can track the price of a product. You can search for the product using its name, or any keyword. Orchid is a good Windows 8 Amazon Price Tracker. You can conveniently use it to track price change for products, and can see the price change history of the product. These both features, and the free availability make it a must use. Use it and share your experience with us.